Brad Paisley is a father, husband, humanitarian, singer, songwriter, and a Stetson-hat-wielding force to be reckoned with in the country music industry. With accolades including but certainly not limited to 3 Grammys, 14 Academy of Country Music Awards, 14 Country Music Association Awards, and a membership at the Grand Ole Opry, Paisley has surely left an indelible mark on the ears and hearts of listeners everywhere. Country music sparked its fire in Paisley at the right bold age of eight after his grandfather gifted him his first guitar. What at first appeared to be a childish infatuation with rock-stardom prompted by a guitar from Sears soon erupted into an undeniable love that would set the foundation for the rest of his life. Paisley thanks his native town of Glen Dale, West Virginia, for not only helping cultivate his newfound passion, but for propelling him to where he is today. With 8 years of experience as a regular on the radio show Jamboree USA and four years of college classes under his belt, Paisley signed as a songwriter with EMI Music Publishing less than a week after his college graduation in 1995. It was here he penned David Kersh’s hit song “Another You,” a ballad that touches on taking responsibility for a heartbreak that is certain to sting forever. Lyrics like, “I guess I should thank you for showing me how love should feel/I know what I’m gonna look for ‘cause I felt it when you held me,” point to not only Paisley’s ability to convey a sincere vulnerability in his songs, but also demonstrate his advanced understanding of the gripping power of language in music. 1999 was the year Paisley introduced himself as the singer-songwriter we didn’t know we needed with the release of his debut album Who Needs Pictures. As a rookie, Paisley executed Who Needs Pictures like a veteran with lyrics like “I hope I’m at least half the dad that he didn’t have to be,” and as a masterful musician with gliding hammer-ons and pull-offs whose audible effortlessness leaves jaws dropping and toes tapping. The album swiftly went platinum, launching Paisley’s long-awaited career in the country music industry. Momentum in one hand and guitar in the other, Paisley opted to fearlessly cannonball into the vast ocean of country music, leaving waves that will impact the sights and sounds of music forever. Never one to play by the rules, he delves into themes of tradition and modernity, heartache and happiness, elegance and muddy pickup trucks in his songs. His sharp wit and confident creativity combine to form music that is sure to keep listeners on their toes. His latest material is no exception. In November of 2018, Paisley released “Bucked Off,” a track about ‘getting back on the bull’ after the trauma of rejection. The tune pairs swinging acoustic guitar strums with deep electric guitar riffs for a dynamic that Paisley himself describes as “turbo honky-tonk music.” Then, in March of 2019, “My Miracle” was released as a tear-jerking ode to faith and love. Rather than overshadowing its meaning, the song is accentuated by a yearning guitar that mirrors the sentiment behind Paisley’s voice. Paisley is undoubtedly one of the good guys and looks back on his accomplishments thus far with humility and endless gratitude. Rather than flaunt his numerous awards on his website, he simply writes “More than I deserve for sure.” He has co-hosted the CMAs for 11 straight years alongside Carrie Underwood and reflects on the development of his life through the lens of the show. He loves what he does, and we do too. 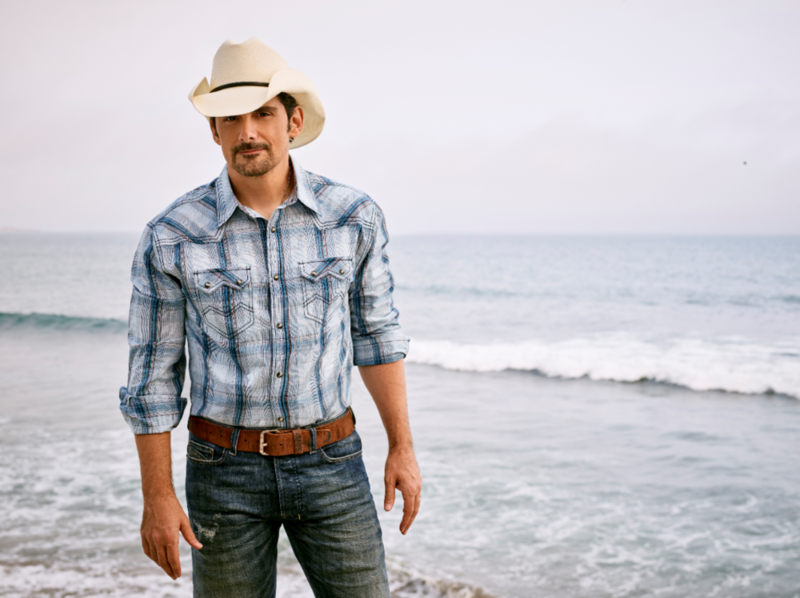 Enter to win for a chance to win tickets to see Brad Paisley perform at Live in the Vineyard Goes Country in Napa Valley this May! We hope to see you there!